Around the world millions of people are protesting against the Israeli state’s latest murderous incursion into Gaza. The humanitarian instincts of the demonstrators do them credit. The Israeli state is waging “asymmetrical” war with a vengeance. Hamas may have provoked the war by launching 2000 rockets at Israeli cities but most have not reached them. They have in fact killed only 2 Israeli citizens, one of them a Bedouin (i.e. Arab). 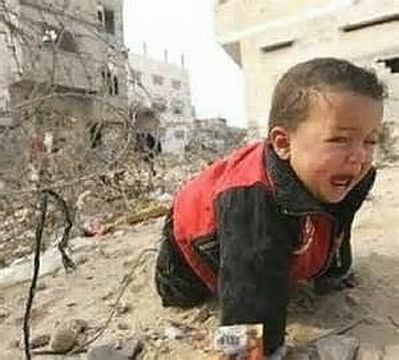 In response over a thousand non-combatants, including 400 children, have been killed in Israel Defence Force (IDF) retaliation in Gaza. This is the third such incursion into a blockaded Gaza in the last 7 years. And this time the IDF’s propaganda machine has not been able to obscure the truth. They said they only targeted places where rockets where known to be stored. The boys killed playing football on the beach gave the lie to that one. They said that the UN schools were safe havens which Palestinian civilians could shelter in. They have since bombed three of them. In fact terrorising the local population is the stuff of modern imperialist war. If the opposing nationalist interests can drive a river of blood between people then it bolsters their own cause. It is another form of capitalist class war as it divides workers from each other. And Hamas is no stranger to terrorising its own population since 2006. They have not only killed Fatah supporters but have ensured that no independent working class voice is raised in opposition to war. It is almost the same in Israel. In this supposedly democratic state terror is the order of the day. Amongst those demonstrating against the war have been several thousand Israeli citizens, both Arab and Jew. They have been subjected to terrorist attacks from the Jewish Defence League (named as terrorist organisation by the UN in 2001) with the active support of the police. Hamas (Islamic Resistance Movement) actually started as a non-political branch of the Muslim Brotherhood in Gaza. It was legalised (and assisted) by Israel to split the PLO in 1973. However in the first intifada in 1987 it split to take part in the resistance. Its previous work of social assistance (against Fatah’s obvious corruption) allowed it to win the 2006 elections. The Israeli state has ever since played on the “Islamist” threat of Hamas to justify more settlements, more refusal to negotiate. And the more it bombs and massacres the more “terrorists” it creates. And if Hamas shows weakness more extreme Islamist groups like Islamic Jihad and the local version of ISIS are waiting to take on the fight. It is a tale without end in the zero sum game we call imperialism. The above is the leaflet distributed in London on Augist 9 2014 by our comrades in the protest against the war in Gaza.